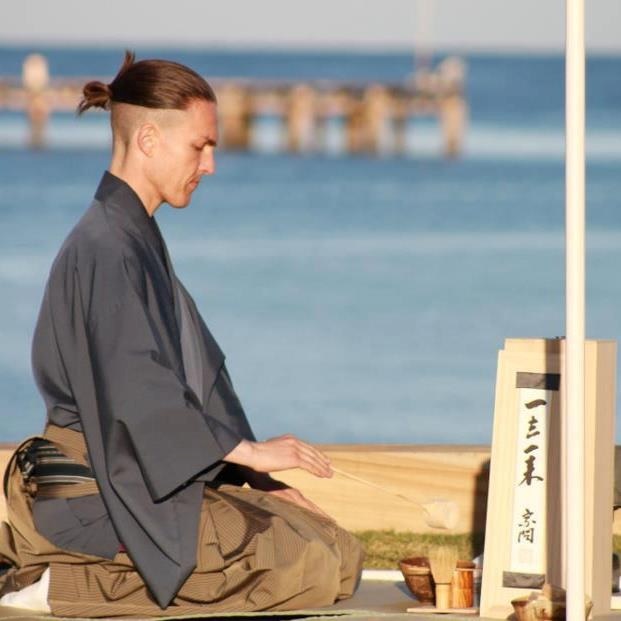 Adam Wojcinski is part of the first Australian group of the Ueda Sōko Tradition of Japanese tea ceremony. Now based in Paris, he returns to Australia yearly and regularly holds tea ceremony practice as well as performances. In a tea ceremony, powdered green tea or ‘matcha’ is prepared in front of guests according to a highly structured procedure. The practice of the tea ceremony, however, involves much more what its English name suggests. The tea ceremony, or ‘chanoyu’ in Japanese, involves all the activities leading to tea drinking; all the utensils used in the tea ceremony; the entire atmosphere surrounding the procedure; and the most important phase, the frame of mind or the spirit which grows out of the combination of all these factors. While studying the tea ceremony, one learns about many arts that are themselves separate disciplines outside the tea ceremony. These include many of the major Japanese arts such as ceramics, calligraphy, poetry, flowers and kaiseki cuisine. A dynamic and expressive performance artist, Adam is fluent in Japanese and, living in Paris since 2015, he can also speak French. Adam’s school presentations reveal essential aspects of Japanese culture to the students. He will demonstrate the tea ceremony to them, with some students being involved. Adam will teach students the importance of tea to the samurai; teach students etiquette for bowing and drinking tea like a samurai; and the values of harmony, respect, purity and tranquility that are central to the tea ceremony. Adam also demonstrates the tea ceremony and explains with the use of funky manga pictures. Session size: 30 maximum (1 x class size). Adam can also do larger group lecture-style presentations – please enquire. Suitable for Grade 3 upwards. Adam is a very engaging presenter and brings a unique perspective to the tea ceremony that I think will appeal especially to male students (in particular the use of manga to introduce the topic is a great idea). The utensils and formal dress add to the authenticity of the experience and the opportunity to partake in the drinking of the tea and eating of wagashi was a bonus!